To complete this wonderful plate below, I did pumpkin talkari. 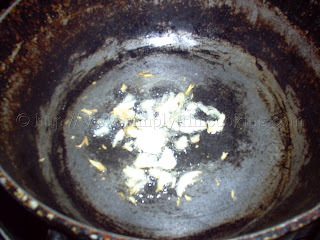 Another simple side dish that also goes great with sada roti. I could remember the days when I used to carry sada roti and pumpkin talkari to school. Again, at the time, some would have thought of it as poor people food but I really enjoyed it. 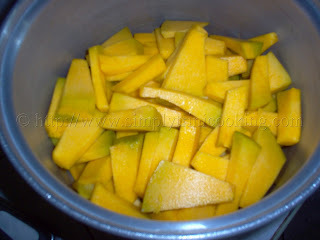 My mother treated squash the same way but I find the squash was a little drier ,so you had to cook it with a little more water. If you don’t have pumpkin at hand you could use squash too.I just remembered the name we had for pumpkin talkari:”Tractor Paint” :^) I know some of you Trinis know what I’m talking about since most of our tractors and excavators are painted in this pumpkin yellow colour LOL! 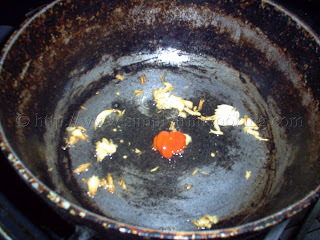 ….I think I have talked enough, so I will just post the recipe now. Enjoy “Tractor Paint”…. I mean Pumpkin Talkari. Cut up pumpkin and set aside. 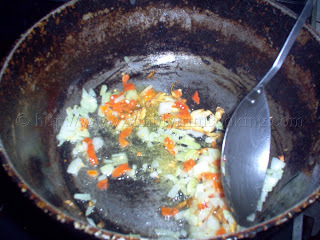 Add the rest of seasonings, bouillon cube and geera. Add the pumpkin and stir. 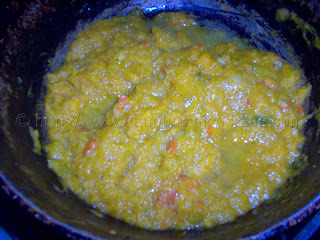 Add a little water and leave to simmer for about 15 – 20 minutes. Add salt and allow to reduce to a semi thick consistency. So ends a fabulous side dish. Bye for now. Hint: If you do not want to use the bouillon cube, just adjust the amount of salt. 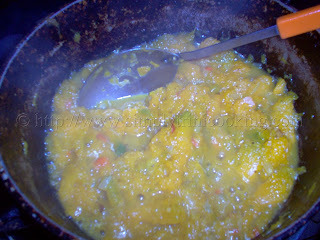 Don’t forget to leave your comment for this pumpkin talkari recipe. 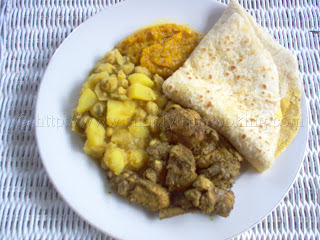 I tried this recipe last week with curry chicken and it was delicious. My husband was so impressed. Thanks for sharing all the recipes…I can’t wait to try more. Keep up all the good work! I think I will try this today! Oh wait, no sugar needed? I swear some places pumpkin talkari tastes sweet. Unless that’s natural sweetness from the pumpkin. Any thoughts? Some people add a little sugar but there are some pumpkins that has a slightly sweet taste also. Hi I’m making this now for lunch. Have had it before but following your recipe which makes it look even easier and it is smelling great! Kids can’t wait to eat! Oh, btw… we know it as ‘Tractor Grease’ lol! 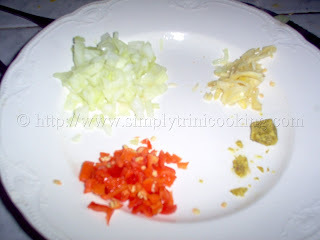 Thanks for posting all these great recipes, I thought I would’ve done this myself for all my friends who love my trini-food, I looked far and wide for someone who cooks like me and lo and behold I just stumbled upon your website. 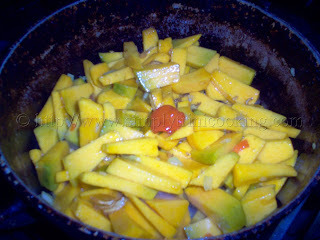 THIS IS REAL TRINI STYLE…..I LOVE IT…. I just send them your link….I just have to make 2 cookbooks for the kids so they’ll always have my cooking even when i’m not there. We have the exact same recipe in Mauritius. I wouldn’t be surprised 🙂 East Indian cooking is all over the globe. Do you see any other recipes on the site that are similar? This is the same a Pumpkin Choka right? Hi hi how many does this serve/how many pot spoons/cups approx? This recipe has approximately 3 to 4 servings. I agree, but that depends on the type of pumpkin used.